This post is a part of our Bioethics in the News series. Visit this page for more information. The Texas case awaiting a decision from the Supreme Court heralds a new understanding of abortion rights in the line of cases from Roe (1973) through Casey (1992). However, another reproductive rights case about having children is also worth revisiting. 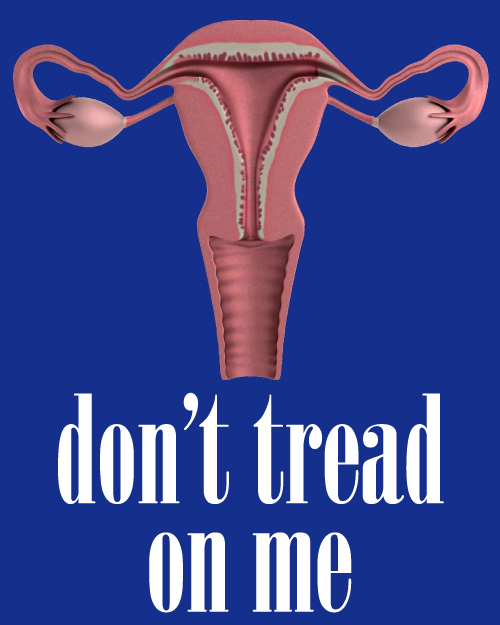 Image description: text under an illustrated image of a uterus reads “don’t tread on me.” Image by Liz McDaniel. The subject of In re A.C. (1990) is Angela Carder, a cancer patient in her last days of life, who refused a c-section at 26 weeks’ gestation. A physician unrelated to her case obtained a court order that authorized the hospital to proceed. Both Carder and the baby died within two days after surgery. An appeals court overturned the order, thereby setting a precedent for the right of a pregnant patient1 to refuse care. Although this precedent was limited to the District of Columbia, it was felt to be sufficiently influential to guide other state court decisions. In the intervening years, however, A.C. has often failed to provide the envisioned protection. 1 On language: this article refers to “pregnant patients” or “pregnant people,” with the goal of including those who give birth who do not identify as women. Image description: text on a green colored background reads “It’s not consent if you make me afraid to say no.” Image by Liz McDaniel. In 1999, Laura Pemberton sued a Florida hospital that procured a court order to forcibly transport her to the hospital for a c-section. The court’s analysis in finding against her was telling: in response to Pemberton’s claim that her constitutional rights had been violated to bodily integrity, refusal of treatment, and family privacy, the court conducted a cursory balancing test between Pemberton’s right to bodily autonomy and the safety of the fetus – in opposition to A.C., which explicitly rejected such a test. The opinion cited A.C. only once, to distinguish Pemberton’s situation from Carder’s: it claimed that because surgery did not risk Pemberton’s death, the hospital was justified in making the decision for her based on the relative risks to parent and fetus. In addition to disregarding A.C., this finding turns the medico-legal doctrine of informed consent on its head. Under it, providers bear a duty to inform the patient of the risks and benefits of proposed treatments, while patients possess the right to consent or refuse, based on their risk perception as combined with their values and circumstances. If relative medical risk were the sole criterion for decision-making, as the Pemberton Court seems to suggest, a patient’s consent would be irrelevant. The Pemberton Court justified its decision with Roe, which grants the state an interest in the fetus late in pregnancy – and thus, an ability to intervene. Roe, of course, addressed abortion rights, whereas Pemberton was a pregnant patient who wished to bear her child. This misapplied doctrine continues to follows the offspring of A.C.
Court-ordered c-sections are now rare, perhaps thanks to A.C. More common are medical malpractice cases that challenge unconsented-to c-sections performed without court authority. Most such cases are still in process through the courts. The A.C. Court reaffirmed that failure to provide informed consent is considered malpractice. However, patients like Dray are hard-pressed to find a willing attorney. The contingency fee model of financing requires the prospect of a significant damage award to offset the $50,000 average cost of mounting a case. Attorneys, judges, and juries alike generally do not acknowledge a recompensable injury when both parent and baby emerge from birth alive and nominally healthy. Sadly, Dray may have succeeded in bringing her case to court in part because she suffered an additional physical injury during surgery. Image description: Lindsay Scarborough Switzer is seated on a couch with her hands in her lap, looking directly at the camera. Image by Lindsay Askins/spotofserendipity.com. A refinement on c-sections performed without consent are those in which consent was obtained by coercion. New Jersey attorney Lindsay Scarborough Switzer was already in the pushing phase of her son’s birth when the on-call physician arrived and abruptly demanded a c-section. After the physician warned of brain-damage to the baby, threatened calls to a magistrate to compel the surgery, withheld requested pain medication, and alluded to a possible removal of Switzer’s older child by child welfare services, Switzer finally signed the consent form that was put in front of her. Switzer is a healthy, educated, determined attorney, who was attended in labor by her husband, a nurse-midwife, and a doula. It is difficult to imagine a patient better situated to hold out against coercion. That she could not indicates that patients in labor are particularly vulnerable to this sort of intimidation, as perhaps may be better understood by considering coercion in sexual assault. Switzer made the full records of her case available to the public before it was settled in late 2015. Image description: Michigan state seal. Public domain image. Although Michigan statute does not grant child welfare authorities jurisdiction over children not yet born, the state’s interpretation of relevant case law suggests that when a fetus is believed to be in danger, that barrier may be demolished. A 1987 bioethics article explored several Michigan cases, one of which had been explored in depth in 1984. The possibility of court-ordered c-sections in Michigan is real; the existence of coercive c-sections is already a reality. Image description: an illustrated silhouette of a pregnant person. Image source. In spite of the legal authority of A.C., the right of competent parents to refuse surgery is often compromised, and their ability to seek redress is limited. Those who reach court are members of relatively privileged classes; what does this mean for everyone else? By asking these questions, this article does not suggest we vilify physicians or deify patients; we are all influenced by the systems in which we live and work – and give birth. Extensive practice guidelines and other resources are in place to support physicians with concerns about possible conflict between patient autonomy rights and physician duty to patients. Institutions ranging from hospitals to the courts must reinforce the policy that the best decision-maker for a potential child is its parent, particularly the one in whose body it resides. Deborah Fisch is a Michigan attorney with a solo practice that offers defense of health care providers against state disciplinary actions. She is also employed at AwakenMichigan: Reproductive and Sexual Justice Project. Her interest in childbirth and maternity care is expressed through her legislative work on midwife licensure through Friends of Michigan Midwives, her legal advocacy and organizational efforts through Birth Rights Bar Association, and her intermittent pronouncements at Mama’s Got a Plan. She was a contributing author to the amicus curiae brief submitted by Human Rights in Childbirth for the Rinat Dray case. Join the discussion! Your comments and responses to this commentary are welcomed. The author will respond to all comments made by Thursday, April 21, 2016. With your participation, we hope to create discussions rich with insights from diverse perspectives. Blair, J. Women Do What They Need To Do To Survive. Hazlitt. 2016. Available at: http://hazlitt.net/feature/women-do-what-they-need-do-survive. Accessed April 6, 2016. Child Welfare Law Manual. Michigan Department of Health & Human Services. Available at: http://www.michigan.gov/mdhhs/0,5885,7-339-71551_11120_17286—,00.html. Accessed April 6, 2016. Ekstrom, SC. Medical Ethics Case Conference: Ethical and Legal Issues in a Court Ordered Cesarean Section. Medical Humanities Report. 1984;6(2). Available at: http://bioethics.msu.edu/homepage/publications/medical-humanities-report. Accessed April 6, 2016. Forcing Pregnant Women to Have Cesarean Surgery Is Never Justified. National Advocates for Pregnant Women. 2014. Available at: http://advocatesforpregnantwomen.org/blog/2014/05/forcing_pregnant_women_to_have.php. Accessed April 6, 2016. Greenfield, B. Mom Sues Doctor Over C-Section Fight: ‘I Was Treated Like a Child’. Yahoo News. 2015. Available at: https://www.yahoo.com/news/mom-sues-doctor-over-c-section-fight-i-was-090037592.html. Accessed April 6, 2016. Hartocollis, A. Mother Accuses Doctors of Forcing a C-Section and Files Suit. The New York Times. 2014. Available at: http://nyti.ms/1oyv82c. Accessed April 6, 2016. Healthy Mothers Matter Too. Available at: http://www.healthymothersmattertoo.com/. Accessed April 6, 2016. In Re AC. Justia Law. 1987. Available at: http://law.justia.com/cases/district-of-columbia/court-of-appeals/1987/87-609-0-0.html. Accessed April 6, 2016. Knowledge, Practice, and Power: Court-Ordered Cesarean Sections. lifescapesorg. Available at: http://www.lifescapes.org/papers/cocs hahn 1987.htm#_ednref8. Accessed April 6, 2016. Opinion 8.08 – Informed Consent. American Medical Association. 2006. Available at: http://www.ama-assn.org/ama/pub/physician-resources/medical-ethics/code-medical-ethics/opinion808.page. Accessed April 6, 2016. Pascucci, C. Obstetrician Ethics: Awesome Guidelines from the National OBs’ Group. Birth Monopoly. 2016. Available at: http://birthmonopoly.com/acogethics/. Accessed April 6, 2016. Pemberton v. TALLAHASSEE MEMORIAL REGIONAL MEDICAL, 66 F. Supp. 2d 1247 (N.D. Fla. 1999). Justia Law. 1999. Available at: http://law.justia.com/cases/federal/district-courts/fsupp2/66/1247/2489193/. Accessed April 6, 2016. Planned Parenthood of Southeastern Pa. v. Casey, 505 U.S. 833 (1992). LII / Legal Information Institute. 1992. Available at: https://www.law.cornell.edu/supct/html/91-744.zs.html. Accessed April 6, 2016. Rinat Dray is Not Alone, Part 1. Human Rights in Childbirth. 2015. Available at: http://www.humanrightsinchildbirth.org/amicusbriefpart1/. Accessed April 6, 2016. Roe v. Wade. LII / Legal Information Institute. Available at: https://www.law.cornell.edu/supremecourt/text/410/113. Accessed April 6, 2016. Section 722.622 Child Protection Law (Excerpt) Act 238 of 1975. Michigan Legislature. Available at: http://legislature.mi.gov/doc.aspx?mcl-722-622. Accessed April 6, 2016. When You Need a Lawyer. American Bar Association. Available at: http://www.americanbar.org/groups/public_education/resources/law_issues_for_consumers/lawyerfees_contingent.html. Accessed April 6, 2016. Whole Woman’s Health v. Hellerstedt. SCOTUSblog. Available at: http://www.scotusblog.com/case-files/cases/whole-womans-health-v-cole/. Accessed April 6, 2016. This entry was posted in Bioethics in the News, Uncategorized and tagged bioethics, cesarean section, childbirth, Deborah Fisch, informed consent, law, reproductive rights. Bookmark the permalink. 2 Responses to Signed Off: Unconsented-To Cesarean Section, A Quarter Century After A.C. I find this discussion extremely important due to my experience in the healthcare field. I have over 6 years of experience as a perinatal nurse and decided to pursue my Nurse-Midwifery degree after working in multiple hospitals where I felt women did not receive true informed consent and were persuaded to have cesarean surgery under threats including “your baby could have brain damage and die” when the objective data (fetal heart rate strip and vital signs) did not support the threats. One particular physician who was the chief OB of the community hospital routinely “cleared the board” by 6pm each night to get home, intentionally not leaving women to labor overnight to avoid having to return to the unit. I especially saw this with young women, often under 25 who were recipients of MediCal, where the reimbursement for a C/S was significantly higher than a vaginal birth. This doctor alone was the instigator for me to pursue my Masters in Nurse-Midwifery in order to prevent more women from falling into these coercive and unethical situations. One case that deeply impacted me was a mother who was a multip with a previous vaginal birth and the OB wanted her to consent to a C/S for arrest of dilation (all other objective data was within normal limits). She refused multiple times until he finally got into a shouting match with her, at which point he stormed out of the room and left her crying hysterically. She was then afraid to allow him to perform the C/S because she was was afraid “he will do something bad” because he was angry she didn’t consent before. It was only when the hospitalist OB came to speak with her and re-assure her that he would be assisting in the surgery and would make sure she was safe that she then consented. As OB nurses we often don’t share these stories because we become so accustomed to these situations, but the truth is that coercive consent is a HUGE modern day problem in obstetrics that gets very little attention. Leah Rashidyan, thank you so much for sharing your experience. I can only imagine how difficult it must be for nurses who are caught between a patient’s wishes and a physician’s orders – just as the physicians themselves are surrounded by systemic constraints that allow and even encourage certain actions. It is to your credit that you went on to nurse-midwifery to address some of these problems! My own interest in writing this article was whether the law has been able to correct the course of economic and institutional incentives that have caused the loss of informed consent for some pregnant patients. The law has been reasonably effective, for example, at making sure that Medicaid patients are not sterilized without proper informed consent, but has been less effective at safeguarding prisoners from unconsented-to sterilization. Although the law tends to work retrospectively, I’d nevertheless be interested to know whether in any of the cases you mention in your comment, the specter of legal action was mentioned. The image of lawyers routinely accompanying pregnant patients to L&D seems a bit farfetched, but on the other hand, legal intervention has worked in some cases. See, for example, https://www.aclu.org/blog/your-body-your-decisions-means-you-moms.